How Can I Get More Fiber on the Low-FODMAP Diet? A reader recently asked me about getting enough fiber on the low-FODMAP diet. This was a big struggle for me when I first started, and I'm guessing a lot of you have the same question. How do I Get Enough High Fiber Foods on the Low-FODMAP Diet? Before I knew about the FODMAPs, I looked for fiber anywhere I could get it. Since my worst IBS symptom was constipation, I was a fiber junkie. I always aimed, at the very least, to hit the recommended daily intake of 25 grams for women under 50. That meant my diet was full of whole wheat bread and pasta, oats, beans and lentils. Plus all the really high-fiber fresh produce: apples, pears, peaches, plums, asparagus, cauliflower, sweet potatoes. I was getting plenty of food high in fiber and nutrients, but I was also aggravating my IBS big time since most of those nutritious foods are also high in FODMAPs. When I took the plunge and eliminated FODMAPs from my diet, I felt less gassy and bloated, but the constipation hung around. I hadn't taken the time to understand the challenges of the low-FODMAP diet, which often include a big reduction in fiber intake. 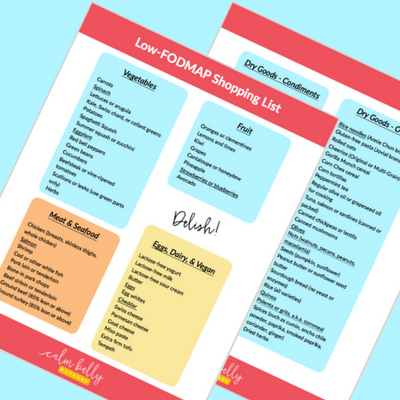 Over time, I did more research, asked more questions and figured out how to make the Low-FODMAP diet fit with my needs. First I'm sharing my personal plan for getting enough fiber rich foods in my diet and staying regular (which is the whole point, right?). Then I'll give more general info and tips about fiber on the low-FODMAP diet. I've been really into designing pretty images lately, so I made a huge infographic to illustrate this post...Go ahead and PIN IT! This is what works for me personally. I've figured it out slowly through lots of trial and error. Remember that all our bodies are different, and most importantly be patient with yourself. You'll figure this out! Note that all nutrition information is approximate and comes from calorieking.com or the manufacturer's food label! Quinoa (2 g per 1/3 cup cooked), brown rice (1 g per 1/3 cup cooked) or whole sorghum grain (4 g per 1/3 cup cooked). I keep my portions relatively small (about 1/3 cup cooked per serving, or 60 to 80g), or I'll start to feel overly full, especially with sorghum. Heather’s Tummy Fiber: Created for IBS, this soluble fiber supplement helps regulate bowels in the gentlest way possible. Many of my clients swear by it! Magnesium Citrate: Magnesium citrate has mild laxative benefits, but it doesn't give me the cramping and discomfort that traditional laxatives do. I take this supplement by Solaray depending on my needs. Other types, such as magnesium glycinate and magnesium carbonate have different benefits. Blue Diamond Artisan Nut Thins, sesame, chia or multi-seed flavor (3 g per 13 crackers). Almonds are the 2nd ingredient so test out your portion size if almonds upset your stomach. For reference a low-FODMAP serving of almonds is 12 g and a serving of these crackers is 30 g.
Orgran Essential Fiber Crispibread Gluten Free (2.3 g per 2 crackers). Made with brown rice flour and sorghum, these crackers are low-FODMAP (no spices or weird ingredients!) and relatively high in fiber. The only bummer is I can only find them online. Okay, that list was kind of a snooze, so let's put it into practice. Here's an example of what I'd actually eat on a typical day incorporating those foods. Total Fiber = 34 grams--woohoo! I hope that helps you visualize how I build my meals with healthy, high-fiber ingredients and put it all together. So are you tired from scrolling through this blog post yet? Haha. Like I said before, this is what works for me, but I hope you can use it as inspiration to experiment for yourself. 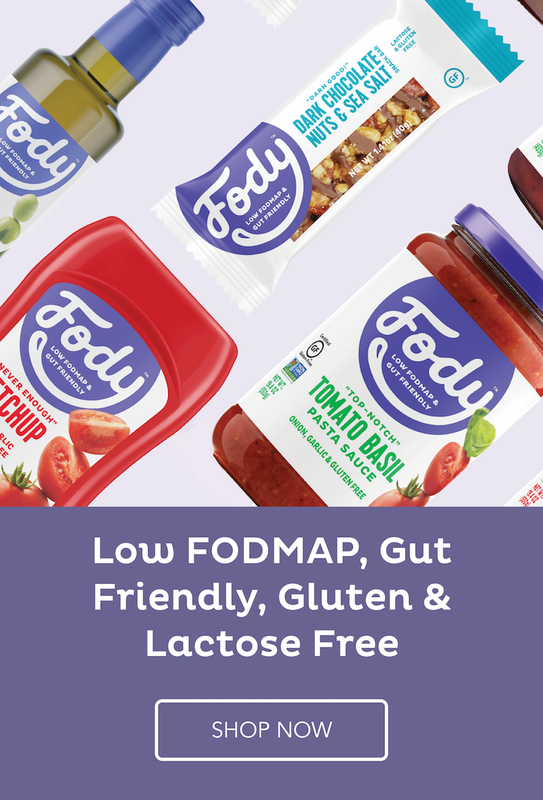 And we can probably all agree that sorting out our fiber needs is key when reducing FODMAP intake, especially when doing the elimination phase!